1. 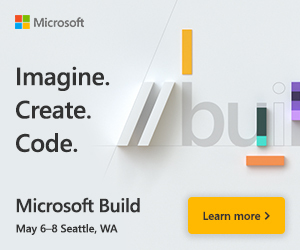 I often forget to turn off OOFs once I’m back in the office, or forget to set these up in the first place— setting up OOFs isn’t exactly a priority for many when leaving for a business trip or a vacation. 2. At times I don’t want to provide the same information to external senders that I provide to internal ones. 3. I don’t want to broadcast to the whole world about being out of office. 4. I hate to respond to spammers (or phishers and identity thieves) and confirm my email address with a nice little OOF response that may also have more personal details about me, including contact information. 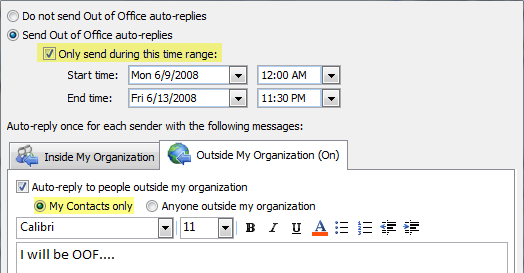 Exchange Server 2007 and Outlook 2007/OWA have help for folks like me. 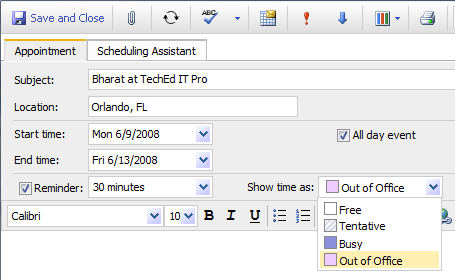 Schedule OOFs: You can beat the last minute OOF blues by scheduling OOF start and stop times using the Out Of Office Assistant in Outlook 2007 [Tools -> Out of Office Assistant] or OWA [Options -> Out of Office Assistant]. Different internal and external OOF responses: You can also setup different OOF messages for internal and external recipients. Restrict external OOFs: You can restrict OOFs to internal senders or your Contacts only. However, OOF auto-responses are sent out exactly once per sender – the very first time the sender sends you a message. When planning to be out of office, it’s a great idea to setup a Calendar appointment for yourself and mark the status as out of office instead of busy. 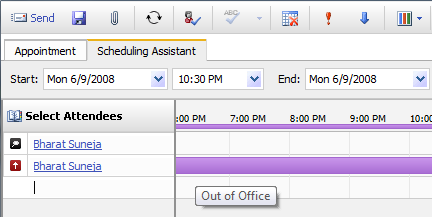 When another user tries to schedule a meeting with you during the period you’re out of office, your Free/Busy information does not show your OOF status. Setting up the OOF appointment in your Calendar allows meeting organizers to instantly identify whether you’re just busy or actually out of the office during the period. – Why is OOF an OOF and not an OOO? A number of valuable web based software solutions are available online; which can improve the operation of a busy office or practice. To combat the loss in revenues, resulting from missed meetings and appointments (to both clients and practioners), some professionals have utilized a web based room scheduling software or appointment scheduler; to monitor client meetings and appointments. Email reminders will reduce no-shows and self-scheduling clients can book, cancel and pay for their own meetings or appointments online. In addition, the scheduler "frees up" time for Professionals to concentrate on other areas of their workload; online or in the office. Thank you for sharing your knowledge and insight.